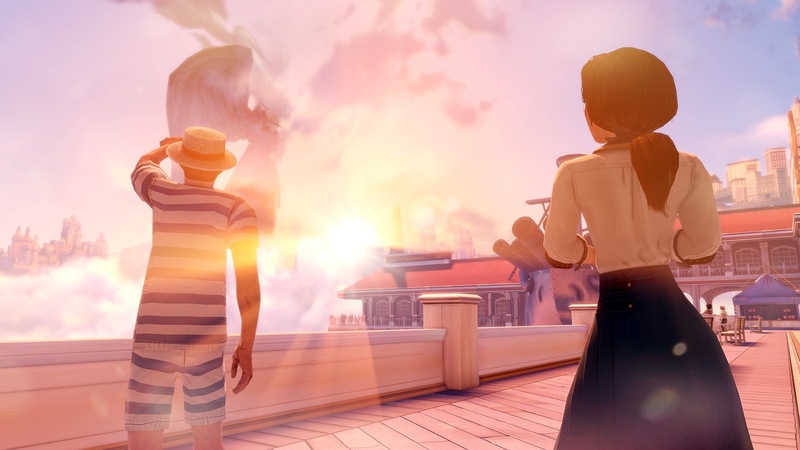 I recently visited 2K Games, where I was given the chance to play Bioshock: Infinite before release and here's what I thought of it. 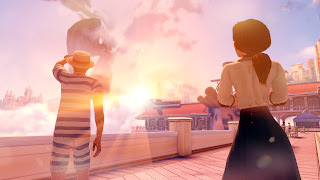 Unlike the previous two titles, Bioshock: Infinite is no longer based in the underwater setting of Rapture, and is instead set in the Sky City of Columbia. Players take control of Booker Dewitt, a 37 year old male with a mysterious background. From the four hours I got with the game, it became obvious that as you progress through the story, more of his background is revealed and things start to make a little more sense. Though, that's not to say everything becomes clear from the start, because it doesn't. The game begins with you on a small boat where you're accompanied by two people; A man and a woman. These people take you to a lighthouse, at which point they leave you to begin your adventure. It's not long before you find your way to the floating Sky City of Columbia, of which when you arrive, you find there to be a strange cult following, ruling over the City. How you get from the lighthouse to the Sky City however, is something I won't spoil! As you progress through the early religion centric sections of Columbia, you're welcomed with lush visuals, a 19th Century theme and socialistic people. Everything seems normal and you're free to explore the surrounding areas. It's not before long however, that things start to feel a little weird. Guards block certain routes within the City, citizens speak to one another, but mostly remain in their own social groups and shortly after you've found the area with Carnival games, you find yourself in a crowded area, facing a stage that has two people chained up next to a host. You're all given a numbered ball and the objective of the game, as you shortly discover, is for whoever has the correct number, to throw the ball at the heads of these slaves, killing them. This is where your options come in. Option A: Do I kill the Slave? Option B: Do I kill the Game Host...YES. The second you turn on the host, everyone discovers your true identity (even if you are yet to discover your true self) and the whole City of Columbia turns against you! Don't worry though, because you now have a possession power, along with a Gun. No sweat, right? Wrong! Aside from the Sky Police now wanting your head, you have mounted turrets and later on, flying sentries to deal with. These combined can pack some serious firepower, so the best thing to do is head for cover and only come out to take out the surrounding threats. Well isn't that a sight. Scattered around the world are Vending Machines that work in the same way as the upgrade system, found in previous titles. They allow you to buy power upgrades, ammunition and health packs to further ensure your success and survival. Tonics are now done away with however, and instead you now have Vigor powers and although they work in the same way, the powers are a lot more grotesque, with the flame grenade power as an example, melting your hand away right down to the bone. Sadly, I couldn't work out how to freely switch between my powers but hopefully this will be addressed in the final version. Adding to the mysterious over-hanging plot is the fact that when you die, you're transported to a strange and obscure black and white room with something constantly trying to break down the doors and walls to get to you. Needless to say, this is more to do with the plot than just an interesting spawn point, though its true meaning is still unknown to me. A little further into the game (around the 3 or 4 hour mark on Hard), you meet Elizabeth who's in some kind of test lab/facility. The character interaction between her and Dewitt is great, and due to the fact Elizabeth is so likeable, you really feel the need to protect her, and that's something not many games have been able to do between character and player relations. Elizabeth is a kind hearted and engaging girl with a bouncy personality. She's a bewildered and naive butterfly who travels where her heart takes her. It's a nice contrast to the violent, slightly dark and slightly sinister surroundings of Columbia and serves as a way to keep things positive. As you explore more, you end up finding all kinds of upgrades. Some are offensive powers, while others are more like static abilities. As an example of this, I picked up something that increased my movement speed, thinking it was temporary but from that moment on, I permanently moved/walked/ran faster. Jumping off a skyrail for a dive attack on an enemy is cool. The main aspect of the game of which you're all probably curious about is no doubt the Rail Riding mechanic. In short, rail riding is awesome. It's incredibly fast paced and offers rapid traversal around Columbia in an almost theme park-esque manner. Not only is it good for transport, but it's also your key platforming tool that allows you to jump and swing to obscenely out of reach places, target enemies for satisfying air to ground takedowns, and is strong enough to support the weight of your character when targeting rails to get you out of combat and danger, fast. 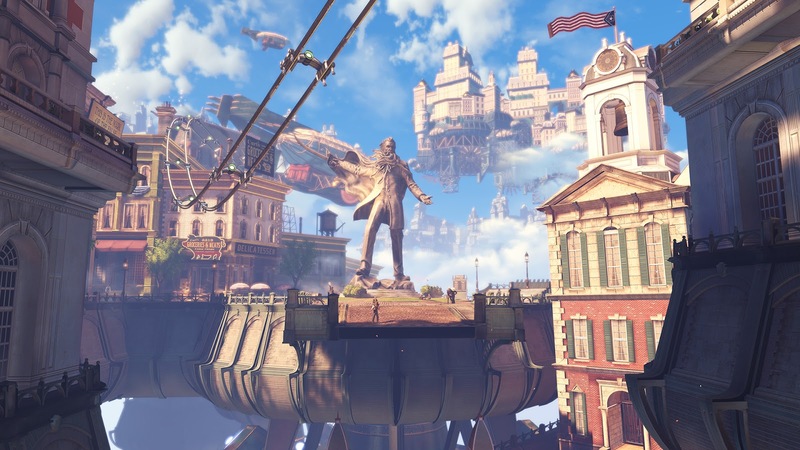 As far as visuals go, Bioshock: Infinite is absolutely stunning. The graphics are great and the world design ingenious with set pieces being impactful. 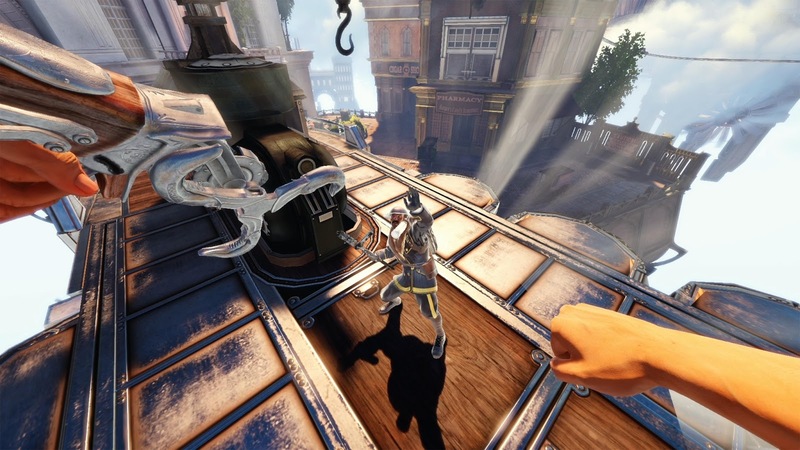 This isn't Bioshock as you know it. It's faster, brighter and far greater in artistic style, yet still feels very reminiscent of the original two titles, where most of the inspiration for Infinite has come from. Bioshock: Infinite is close enough to the original two titles for fans of the series to remain complacent, yet builds upon the already established foundations fans have come to love and expect, offering a more immersive and engaging title that will no doubt appeal to most gamers, and I for one can't wait to get my hands on the full verison. 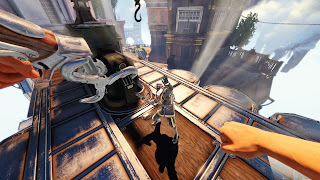 Bioshock: Infinite is scheduled to be released on Tuesday 26th March on the Xbox 360, PlayStation 3 and Windows PC.